Kyanite is a bluish-green to colorless triclinic mineral. Its chemical formula: Al2SiO5. It occurs as long, thin, blade-shaped crystals in metamorphic rocks. It is unique among minerals in having two grades of hardness, one along its length, and one along its width. It is a polymorph of andalusite and sillimanite, but can form at lower temperatures than either of these. Kyanite is one of the very few stones that do not absorb negative energy, so it does not need cleansing (another stone is citrine). Kyanite is also a very peaceful stone, a stone that gently rebalances one’s energy and promotes a healthy and peaceful way of being. 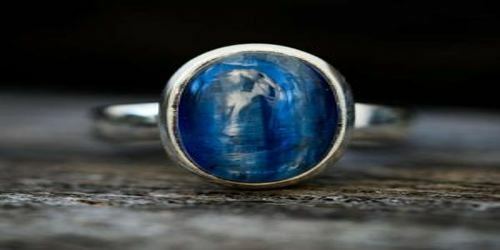 Kyanite is named for the Greek word for blue, kyanos. And what a blue! Fine Nepali kyanite can resemble the finest sapphire. Kyanite was a gem far better known to mineral collectors until more recent finds in the Kali Gandaki river region of west central Nepal, the first source to produce a significant amount of facet grade kyanite. 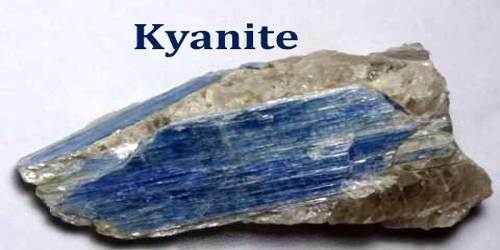 Prior to the Nepal discoveries, Brazil was a major source of mineral specimen material, but kyanite also occurs in a variety of locations around the world. More recent kyanite discoveries have yielded additional colors, including orange and green. Kyanite is the high-pressure polymorph, sillimanite forms at high temperature, and andalusite is the low-pressure polymorph. 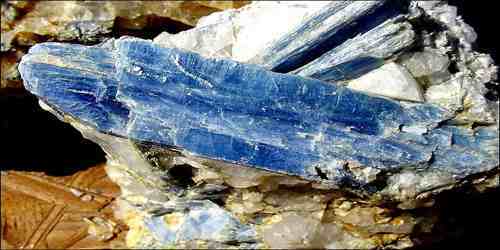 Most people have not heard of kyanite, as it is infrequently used in jewelry. It is an “exotic” gem. High-quality and nicely colored kyanite can be cut into attractive and desirable cabochons and faceted stones. These are often used in rings, earrings, pendants, and other jewelry. Kyanite is also used to make beads. These beads often have a flat geometry because the mineral typically occurs in thin blades. 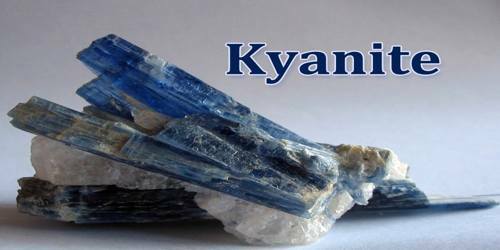 Kyanite is used primarily in refractory and ceramic products, including porcelain plumbing fixtures and dishware. It is also used in electronics, electrical insulators and abrasives. It is one of the index minerals that are used to estimate the temperature, depth, and pressure at which a rock undergoes metamorphism.